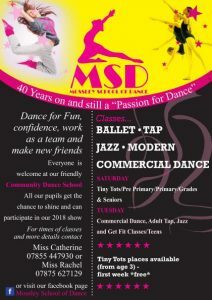 Mossley School of Dance was established at Abney Church in 1975 and moved to the Mossley Community Centre in 1978. It is one of the longest standing groups at the Mossley Community Centre. Dance lessons are given in Ballet, Modern and Tap and pupils are taken from the age of 3. We also run adult lessons in Dance and Keep Fit. In the last 30 years we have seen many changes to the world of dance, but one thing that doesn’t change is the sheer delight and confidence that children gain as they grow and go through the Dance School. Growing all too quickly from tinies-to teens-to adults making life long friends on the way and in turn bringing along their own children. 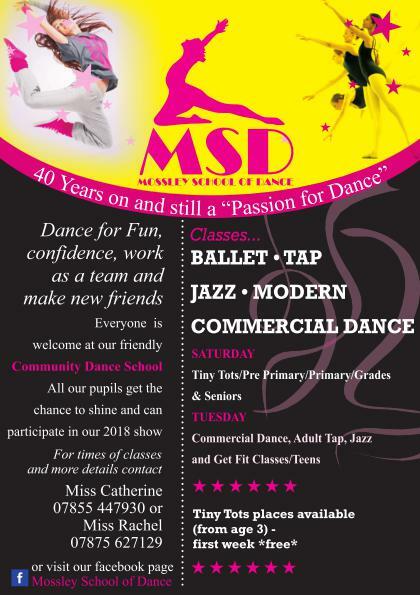 Mossley School of Dance caters for all ages so you can grow along with your dancing skills. We have showtime in May and we are happy to get all the family involved in this; backstage, front of house, sewing, singing, dancing. Over the years Mums and Dads have done it all and we really appreciate all the help that is given. Mossley School of Dance is run with community spirit in mind and the proceeds from all of our shows goes to charity. Robert McCune – 01457 836354.